the stylized pictures are laughable in a nathan barley way. seems like a good idea, however the overhead locker has my laptop in it and you are only allowed one small piece of hand luggage on most flights. I suppose you could put this in a bag with the lappy but then it would be too big. Shouldn't it fold the other way, to protect the keys and knobs when you stash it away? This blather about poly aftertouch is getting a bit tiresome. Since the early 1980s I've seen keyboard reviews complaining about the lack of aftertouch, then later (when most synths had it) polyphonic aftertouch. OTHER keyboard instruments didn't usually have it. And I'm not sure the average player would know how to use it. One of those things that people ask for but don't use. magnesium.... on an airplane.... I'll believe it when I see the TSA allowing that on board. You can strike sparks off a chunk of magnesium, with the back of a pocket knife, to start a fire from tinder. Wonder if you can spark a fire with this keyboard? Or if, once it's ignited, it'll burn a hole right through the floor before you can do anything about it. Magnesium burns pretty hot, don't it? Try first carrying a pocket knife into a plane. Awright, a steel key, then. Plenty of pieces of steel you can carry with you. "...is made of powder coated Magnesium alloy"
That Xylosynth thing has been folding in half for years without problems, so its clearly a workable idea. It might *fit* into an overhead locker but in addition to size restrictions for hand luggage, most airlines also have weight restrictions. 25lbs = too bloody heavy. Not to mention that you would still need a suitable padded bag (more weight). As someone already pointed out, you can only have one item of hand luggage these days. Therefore in order to have the 'advantage' of bringing a midi controller on as hand luggage you have to sit through the entire flight without any of the usual necessities like a laptop/books/whatever. Daft, probably very expensive and, moreover, utterly pointless. I wonder if it has weighted keys? 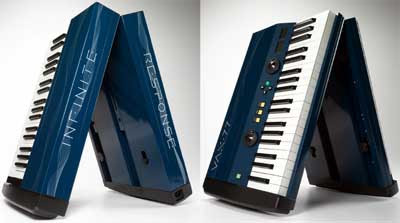 If Yamaha can make the 12 lb NP-30 keyboard, can't you get together and make a folding, compact 12 lb super-keyboard?? One carry on bag isn't a problem. Just put the keyboard in a back pack along with a laptop. As far as weight limits for carry on.....blah blah. I travel all over the world for years and not once has a ticket agent weighed my carry on bag. This is a great idea that will solve the traveling pianist problem. Hopefully it will have weighted keys to allow seamless transition between the acoustic. Re the comment about magnesium not being allowed on a plane, my laptop is magnesium alloy, as are many non-low-end laptops.